It was no small delight to join in celebration worship on February 5th, marking one year since the church moved to its new site. Pastor Michael Maura of Bethesda Baptist Church, Nairobi was the visiting preacher. The tent, which was filled to capacity, has withstood winds, rains, and sun for the past ten years. Pray for the salvation of sinners as we reach out to residents around the site. Finally The Church Building Project Has Begun! The deadline which the County Government gave to Grace Baptist Church to commence its approved building project falls in April 2017. Close consultations have been going on with the engineers. So with this pressure on, the building committee held a crucial meeting on January 22nd knowing that something has to begin. The Lord graciously led the church trustees to sign an agreement with a contractor and on January 23rd the work commenced. The Structural Engineer visits the sight regularly to ascertain that standards are observed. There will be periodic site meetings between the church, the contractor, and the engineerto review and discuss the way forward together. 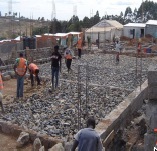 The construction of the pastor’s house is also having to go on at the same time due to the same deadline of approval of plans but they are independent projects. The whole site is a beehive of activity and there is need for speed and safety.